Happy Needle and Thread Thursday, y'all. Yesterday, time spent in my sewing space was all about solving an immediate problem. I usually don't wear jeans when I teach because I want to look a little more polished. I have learned though, that certain shoes may be comfortable for a few hours, but they just don't work for an all day class. It occurred to me that I needed to invest in some cute quilting/fabric related shirts, so that I can wear my jeans and Converse, and stay comfy while walking around for hours. I figure I'm good dressing casually as long as I keep it quilty. My first attempt at solving that issue was to order two cute shirts from Patchwork Threads. Their designs are so cool, and I was excited to get my order. Unfortunately the sizing was way off for me. Granted, this is my own fault for looking at the sizing chart and estimating, rather than taking exact measurements. Lesson learned (and now I have a couple of cool sleep shirts); but I'm teaching at a retreat in Hattiesburg, MS this weekend, so I had to take matters into my own hands. I pulled out two of my favorite tees, some of my most treasured fabric bits, and went to town. Gray t-shirts are a casual basic in my closet, and I probably have four or five of them at any given time. I used Heat n Bond Lite to appliqué (so easy to use! ), and just stitched around each piece. Playing around with the layout of the petals was so fun, and I'm glad I offset the rosette to add interest. I saw a similar shirt a LONG time ago, and loved the look, but I am so sorry that I don't remember where I saw it (let me know if you do, and I will update with a link). On the charcoal gray tee, I wanted to give the effect of an improv stripe, but I didn't actually want to sew the pieces together. I worried about added bulk affecting the drape of the shirt. Instead, I arranged them ticker-tape style, and although it looks more plain in the photo, it is super cute on. I've never really been big on applique, but these were really fast and fun, and best of all I can be comfortable while teaching. Last week's party really rocked, y'all! 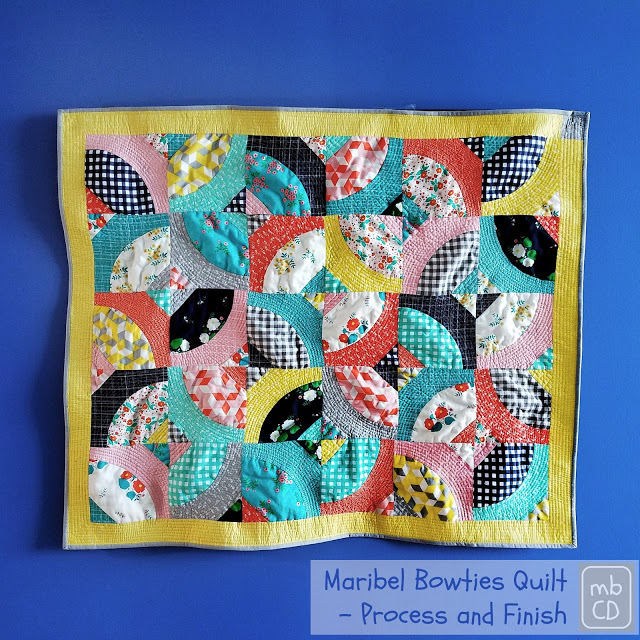 Some of my favorites included this Maribel Bowties quilt by Made by Chrissie D. Chris shared lots of process photos for this cool Drunkard's Path variation, so hop over there if you missed it! 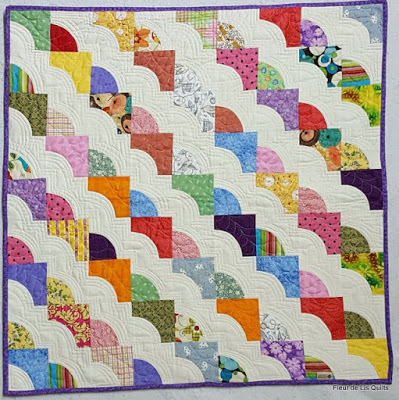 This pretty quilt is by Michelle at From Bolt to Beauty. 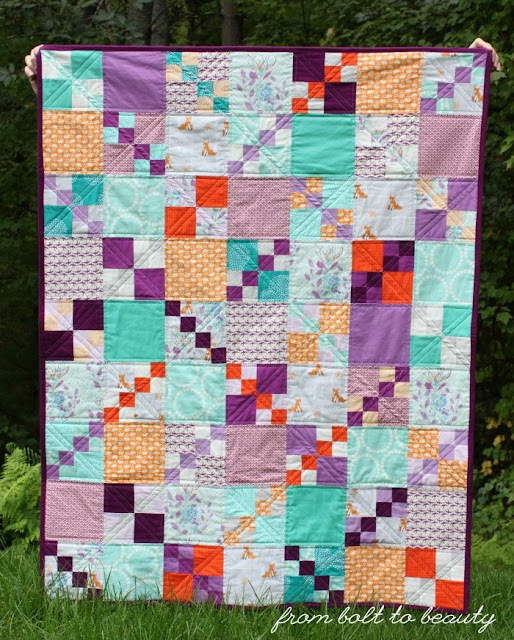 and Mary at Fleur de Lis Quilts linked up this sweet baby quilt. I love this Drunkard's Path layout, too! Time to link up, friends! **PLEASE NOTE- for the past couple of weeks, there have been several spam links on our parties that are not quilting and sewing related. My initial reaction was to delete them immediately, but my linky service provider has asked that I leave them so they can be investigated and permanently blocked. I will remove those links after my provider has all of the info he needs but it may take a few days. So, please do not click on any links that are not clearly quilting related, and thank you for your understanding! Love your shirts! Jeans and converse are the way to go!!! P.S. Thanks for the shout-out for my Foxes and Flowers Quilt! The t-shirts are so pretty. The vibrant colors look great on the grey, my favorite neutral. I also like to use t-shirts to make dresses by cutting just below the sleeves and adding a gathered skirt area. All of those quilts are beautiful. I love the Drunkard's Path block. Ohhh, that's fantastic! I need to do that!! So they won't fray when you used Heat N Bond, right? I've never used it before. You'll look awesome teaching in those! I love the shirts!!!! I need to make some too!!!! Your shirts look great! Have fun teaching this weekend. Thank you for hosting NTT! OK. Those t-shirts are fantastic! I'm going to have to give this a shot! Love the shirts! Where are you teaching? I live in Hattiesburg! Hey Judy! The Quilted Petal is hosting a retreat. I'm giving a lecture/trunk show Friday night, and on Saturday, we're going to be doing some alternate grid work "floating block" design practice, and working on my Bubble Bath pattern. It is really going to be fun, and I am super excited about it! That explains why I couldn't find any information on the Hattiesburg sites. I've never been to The Quilted Petal -- it's about 30 miles from where I live, but I should definitely check it out! Have a great time! Hey Kelly!! Your t shirt design is really cute!! The fabrics just pop on the charcoal shirt!!! Really awesome!! I had the same issue with Patchwork Thread shirts! I purchased an XL - it was too big so I returned it for an exchange but they were out of stock on the L. I waited almost a month and when it was still out of stock, I decided that a M would still probably work. Nope. Not even close. It was just too tight. I've kept it but still not sure what to do with it. I couldn't justify paying the return shipping a second time. Very clever to make your own though! 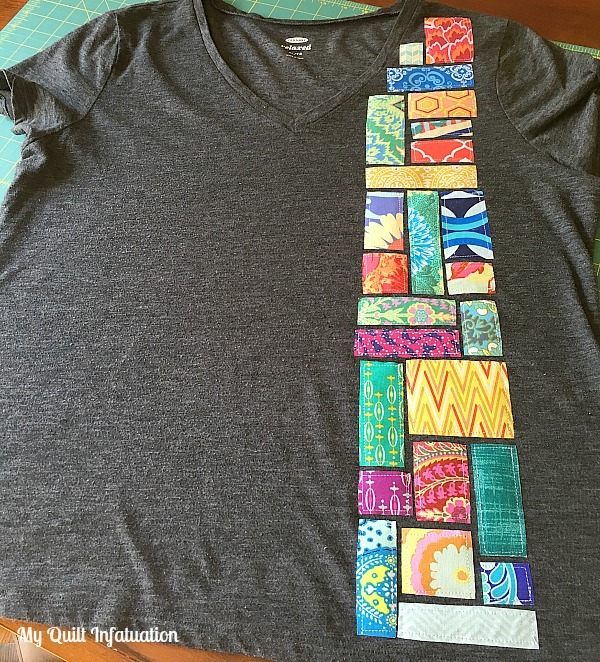 Alot of cute tutorials can be found on Pinterest to alter loved tshirts that may have shrunk. Like adding a fun contrast knit strip or a lace knit strip inset to the side seams. Just an idea. What a clever idea for adorable shirts. Love the t-shirt idea and quite timely too. I have plans to cover up a logo on the front of a t-shirt (I like the pretty pink color but not the logo) but I will be hand appliqueing it. Did you use any kind of stabilizer behind the pieces when you machine stitched them? Fantastic work on the t-shirts! I'm all for being comfy, and these work perfectly, filling all criteria. You may have to give a workshop on making them! 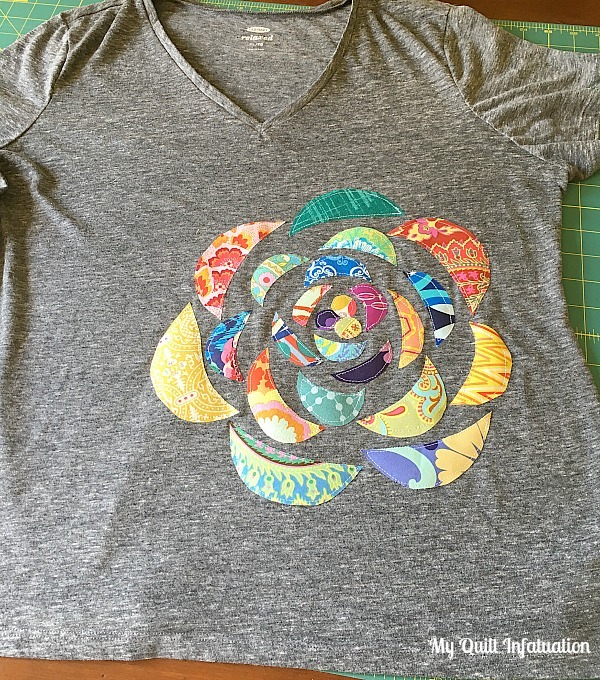 Your tshirts turned out really cute.I think I have had that same floral design inspiration pinned to one of my craftboards but not sure where it originated from either. Ordering online is a crap shoot most days around here. I had the scary situation of having to order a dress online overnight for a wedding last week. I couldn't find anything I liked locally and then time got away from me.LOL Luckily it arrived and it fit. Thanks for linking up to this week's TGIFF.